Scottish comedians have played an unfortunate second fiddle to English ones for years. When people think of the most devilish, dark humorist on the planet, Jimmy Carr comes to mind rather than Frankie Boyle. And in the absurdist realm, Sacha Baron Cohen is king, not Limmy. Maybe it has something to do with their accents. Maybe it’s something to do with the type of humor. 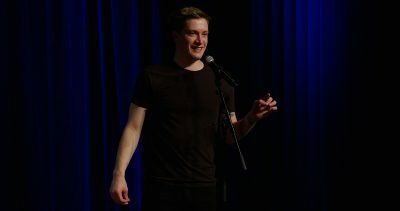 Maybe it’s the fact that Daniel Sloss isn’t more well-known. If Sloss’ new Netflix specials “Jigsaw” and “Dark” demonstrate anything, it’s that Boyle’s unforgiving demeanor is emphatically pronounced in his performances. The two shows are part of a series called “Live Shows,” and what distinguishes them from most other comedy specials are his solemn, emotional U-turns. The results are two wonderful comedic routines that are red-hot in comparison to the lukewarm sea of Netflix specials. In a way, Sloss’ comedy mirrors the work of Jim Jefferies, who balances out his irreverent material with social commentary on America’s most publicized political flaws. Frankly, audiences could go either way on this. If you agree with him, Sloss cogently analyzes the most pressing issues affecting U.S. communities today. To those who don’t agree, he’s an arrogant foreigner who can’t stand the fact that the United States isn’t as good a country as his homeland. In “Dark,” Sloss tells a story of one of his shows in Indiana where he told an anti-religion joke that made 40 percent of the audience leave the theater. He looked down to see a man in his seat had lifted his shirt up, which exposed a gun holstered on his pants. “You’re lucky I don’t shoot you,” the man said. This is Sloss’ crash course on how to successfully split a crowd, but the comedy is certainly there. Another good portion of the time, Sloss expresses his ironic hatred of vegans, specifically “Facebook vegans.” In both specials, but especially in “Jigsaw,” he goes on about how annoying they are, even going to some insane lengths to show how much they irk him. “If you are a Facebook vegan, from the bottom of my heart, I hope an animal kills you,” he said. His first special is titled “Dark” and aptly so. The content of the show is either edgy and offensive or unapologetically serious. It’s nowhere near the type of material that would make the audience throw bottles at him, but it’s the kind of material that forces him to regularly interject with disclaimers that he is joking and that what he’s saying shouldn’t always be taken seriously. The seriousness comes in when Sloss talks about his sister with cerebral palsy, who died when she was just seven. Some comedians have unique ways of incorporating emotional material in their routines, but what makes Sloss’ approach so different is that he didn’t start by saying his sister had passed away. Instead, he worked up to it, referring to her in the present tense and inferring that she was still alive. In a bit of a cocky way, he called this tactic “cleverly crafted,” but he is correct in saying so. He spends a good 20 minutes talking about his sister, but also about how to act when comedians bring up disability. “If you’re laughing at the disabled person, congratulations, you’re a pile of s—. But if you’re laughing with them … what a joy!” he said. Both of Sloss’ specials hit on what every good stand-up show should. Just as he starts to seem like an inconsiderate dirtbag, his humanizing bits buttress his routine. For someone trying to break into comedy’s mainstream, Sloss’ “Live Shows” collection is an excellent break.